Located in Los Planes De Renderos, Puerto del Diablo, or Devil’s Door, is made up of two striking boulders that reach for the sky. 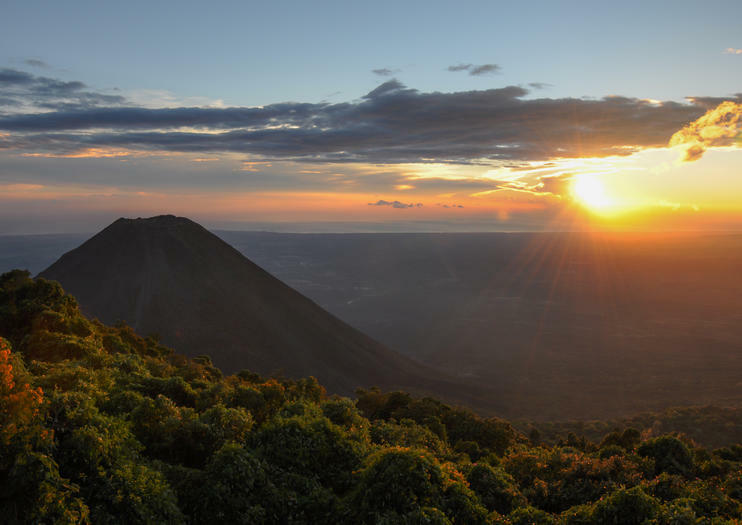 Looking between them gives the viewer a panoramic vista over the sights of El Salvador all the way to the Pacific. Devil’s Door is one of El Salvador’s most popular rock-climbing sites, with dozens of established routes for all levels of climbers. For the best views, climb the rock stairs to the top, where you'll rewarded with sights like the red-tiled roofs of the indigenous town of Panchimalco, Lake Ilopango to the left, the double peaks of the San Vicente volcano straight ahead, and beyond it, the Pacific Ocean (if you bring binoculars). Visitors to Devil’s Door can opt to take a canopy tour, go zip-lining, explore the nearby caves, or even rappel down the cliff’s face. A visit to Devil’s Door is an easy way to escape the city noise of San Salvador for a half day, as it’s only a short bus trip to and from El Salvador’s capital city. Insider’s Tip: Visit the marketplace below Devil’s Door before you head to the top. Fueling up with freshly made pupusas is a great way to prepare for the ascent. Devil’s Door is about a 45-minute bus ride from San Salvador’s history city center. The natural attraction has several different routes and offers beautiful views from every direction.